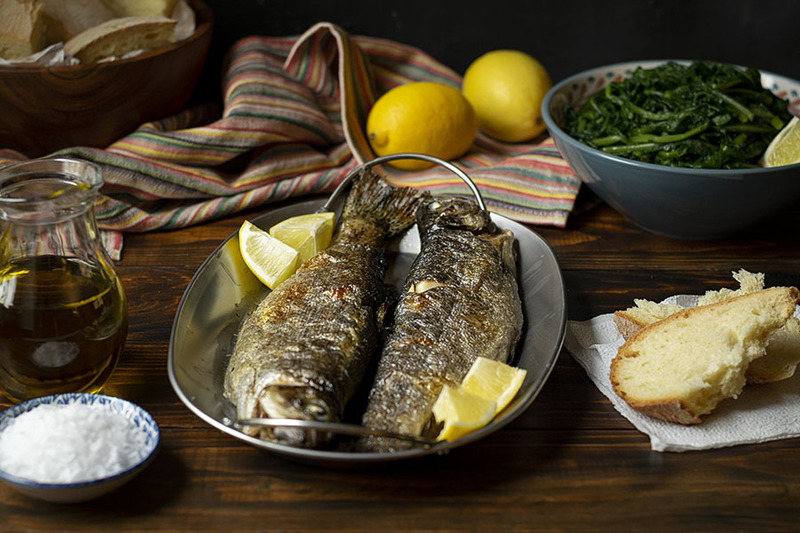 This easy recipe for simple broiled trout with dandelion greens can be ready in less than 30 minutes and is ideal for a healthy and quick weeknight dinner. It’s well known that the Mediterranean diet includes a lot of fish, and I’m ashamed to admit I don’t eat fish as often as I should (or could). But when I find some nice looking rainbow trout on the market, I don’t pass on the chance to make myself a healthy and delicious dinner. Like most fish, trout don’t need much time to cook (overcooking it will result in a dry, bland fish) and it also doesn’t need a lot of extra ingredients to be tasty. Less is more as they say! 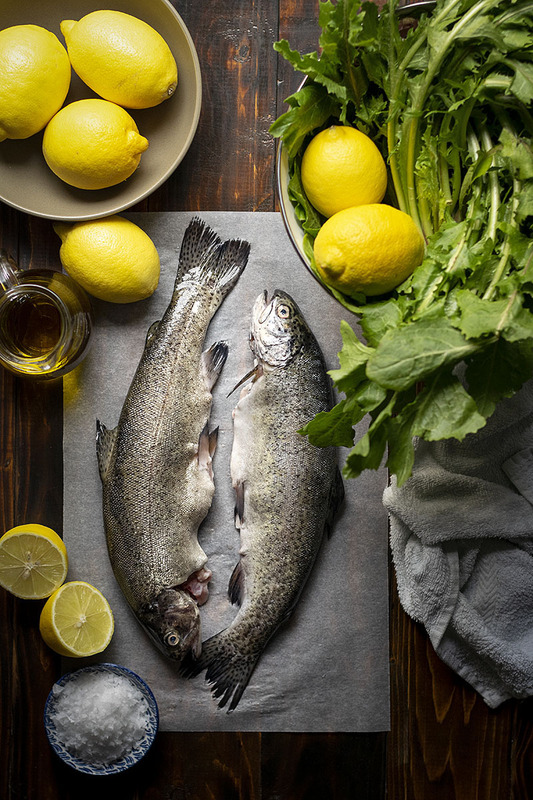 That’s why this recipe for simple broiled trout with dandelion greens is ideal for a weeknight dinner, and especially for when you don’t want to spend a lot of time in the kitchen. Every time I eat trout I remember a certain place in Crete (it’s called Zaros) where there’s a lake and a couple of restaurants that serve fresh fish. 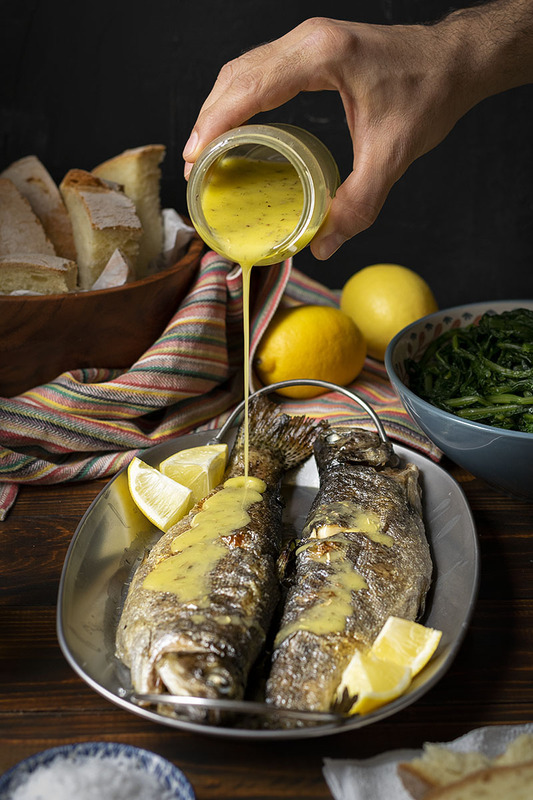 My whole family’s favorite dish was (and still is) the rainbow trout, simply cooked over charcoals with some lemon-olive oil dressing drizzled on top. Because I don’t have the heart to light a fire inside my apartment, every time I want to recreate this recipe, broiling the fish is the next best thing I can do :-). And because rainbow trout is covered with very small and thin scales that you probably won’t even notice them (especially if the fish is small), I don’t even have to remove the scales. All the prep I do is to rinse the gutted fish very well and dry it with some paper towels. 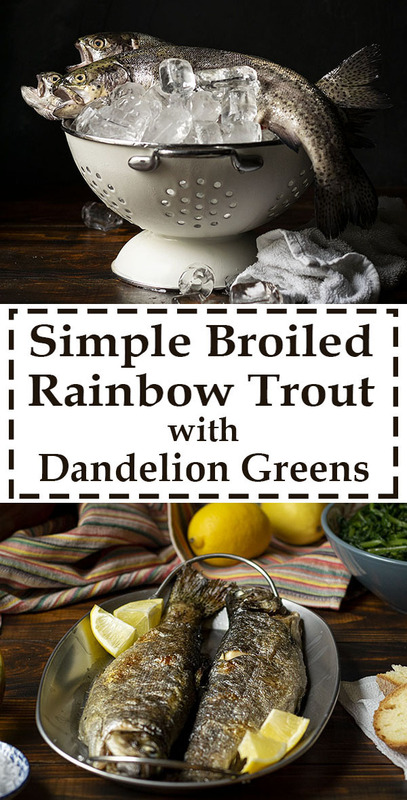 Trout goes perfectly with cooked greens like the dandelion greens in this recipe, but you can also use any type of greens you like best, or you can serve it with a Greek salad (Horiatiki) instead. Here, the dandelion greens are also simply cooked, boiled in salted water (like the Cretan traditional way). When done, they’re drizzled with lots of freshly squeezed lemon juice and olive oil. For a complete meal, don’t forget some thick slices of sourdough bread or a few Cretan whole wheat rusks (the hard ones) barely soaked in cold water. Cooking time will depend on the size of the fish, but 2-3 minutes more or less won’t have any dramatic impact on the final result. You can also serve this with beet greens, mustard greens or amaranth greens. White mustard greens is another favorite ingredient of the Cretan cuisin and if you can find some you can also try this potato mash with red beans, egg, and mustard greens recipe. Boil the greens in salted water. It apparently helps them retain their color. Rinse the trout well under running water, drain and pat dry very well. Preheat your broiler to high and bring a large pot filled with water to a boil. When the water comes to a boil add the dandelion greens and the salt and cook for about 20 minutes or until tender (you should be able to easily squeeze the thick part of the stems between your fingers). Drain in a colander, transfer in a bowl and mix with the lemon juice and the olive oil. While the dandelion greens are being cooked, rub the trout with the 2 tablespoons olive oil and sprinkle them with some salt. Transfer them to a pan and place the pan on the top part of the oven. The pan should have 4-5 inches (10-12 cm) distance from the broiler. Cook for 9-10 minutes from one side, then using two spatulas, flip and cook for another 9-10 minutes. Make the dressing: Transfer all the ingredients for the dressing to a jar and shake well to combine. 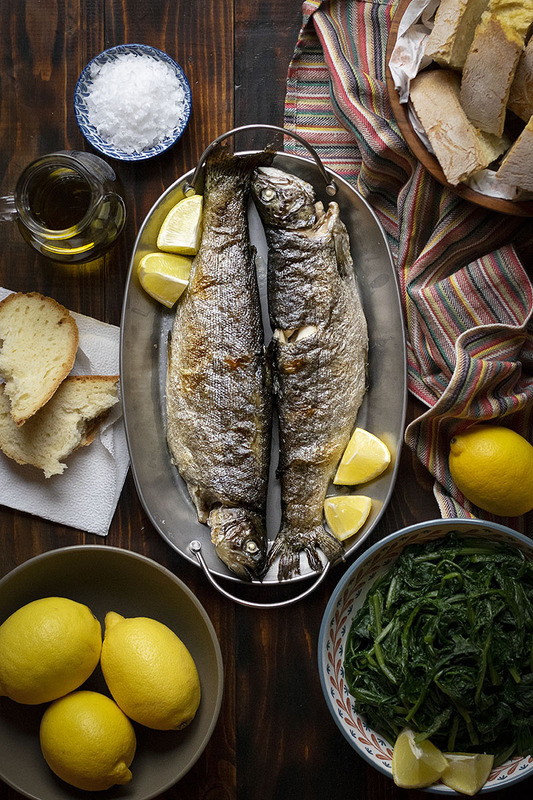 Serve each fish with some dandelion greens and thick slices of sourdough bread. Drizzle with the dressing and eat. You can add a few quartered potatoes to the pot with the dandelion greens if you don’t want to serve this with bread. Cooking time for the trout will depend on the exact temperature of your broiler and the distance of the pan. Test for doneness with a fork when you see the skin dry and browned. The fish can be served whole on plates. The skin will be easily removed by pulling it with your fork. Open the trout in the middle (lengthwise) and remove all the bones. Drizzle with the dressing and add extra salt if needed. I absolutely loved the photography Mako! 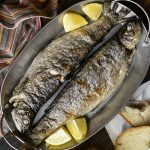 I look forward to trying this recipe if I get lucky enough to find rainbow trout as fresh as the one you used here! Thank you! It’s a favorite ? This dish is a classic! 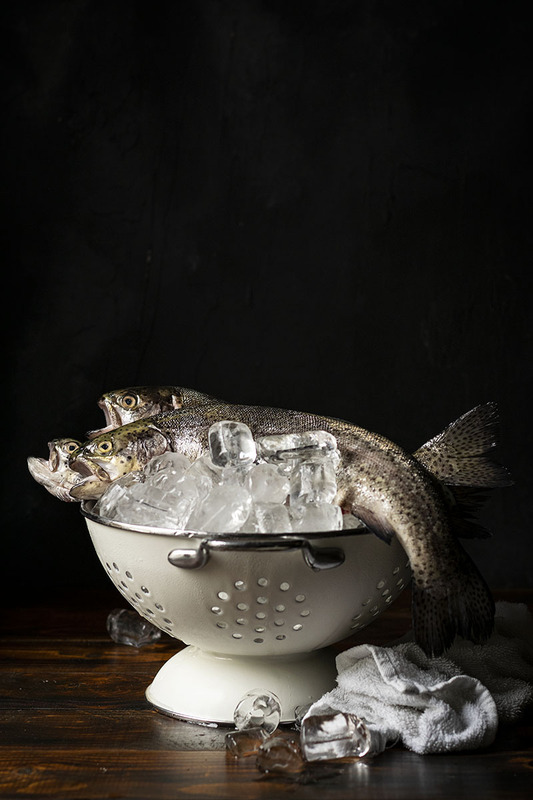 Rainbow trout is one of those fish that people don’t always associate with Greek cuisine, but the truth is that it is used whenever it is available. These dandelion greens really provide a nice contrast, as well. Thanks Nick, happy you like it!!! Trout is one of my favorite, but its hard to find it here in seafood markets. I have tried it many times from restaurants and its so delicious. You know this recipe is a keeper because I dont have to scale the fish!! I need to eat more fish, and this looks amazingly delish! Aw man, why can’t you be closer so I can just steal food from you heehee, you always have such yummy things going on!